Model railroad switches, just like real-life railroad switches are used to route rail traffic. In model railroading, switches are most commonly referred to by the technical term "turnouts". In the UK rail switches are referred to as "sets of points" or just "points". This is because the moving rails within the switch are called points. Trains enter turnouts by a single track and can be routed to either of two or sometimes any of three, ​existing tracks. ©2012 Ryan C Kunkle, licensed to About.com, Inc. If you want the train entering a turnout from the single track end to continue in its current direction the switch is closed or normal; but if you want it to diverge in another direction the switch is thrown or reversed. Some turnouts are curved. Two-way turnouts come in left-hand and right-hand varieties, where left and right are the directions a train entering from the single track end of the turnout diverges when the switch is "thrown". 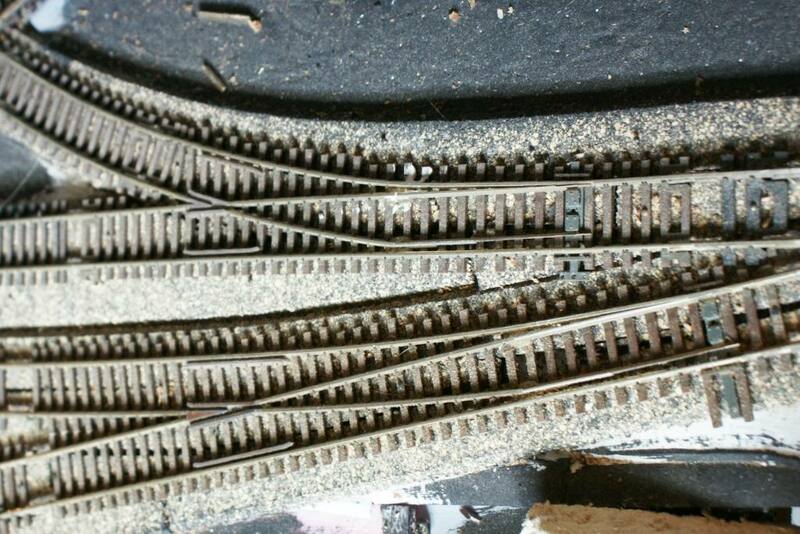 A few manufacturers of model railroad track offer curved turnouts. In the case of curved turnouts, if the switch is closed, the train continues on the curve's current radius, and if the switch is thrown, it turns into a curve of a tighter radius. A turnout's number expresses how much it will cause a train to diverge when it is thrown. The number refers to the switch frog specifically, but the entire switch structure can be known by number as well. The number is calculated by taking the number of units of forwarding travel for one unit of divergence. Photo courtesy of Atlas Model RR. Co.
A wye turnout has no straight exit track. In addition to the "Y" shape, these switches are also frequently used in a larger track arrangement also called a wye. It has exits that turn to both the left and right. A wye is never closed, only thrown left or thrown right. In the unusual case of a three-way turnout, the switch can be thrown left, closed, or thrown right. Three-way turnouts are a kind of exotic item. They aren't made by a lot of track manufacturers. Marklin, Peco, and Shinohara are the only manufacturers that we know of who make them. A special kind of turnout is a "crossover" turnout. A crossover turnout allows trains on one track to continue straight or crossover (diverge) onto an adjacent parallel track. A "double crossover" allows both parallel tracks to diverge onto each other. Photo courtesy Atlas Model RR. Co.
A double slip switch is similar to the double crossover discussed above. It has no straight tracks; it has two tracks that cross over but can be switched to curve back to the side of the crossover they came on, instead of continuing on a straight path.